The title in 'Le cygne et son image’ soon becomes the white canvas on which Nyst has drawn what appears at first as a tail or a path. The screen is horizontally divided in two, the lower part occupied by the canvas and the upper by Nyst’s naked body. When the swan the title refers to appears, it may seem that it is its own image that it contemplates on the white surface. Nyst’s swan is a walking stick but that of course doesn’t matter. Once more Nyst’s work appears as an affirmation of the universe contained in everyone’s home, and over all of the poetry emanating from every day’s objects. This short video is one of Jacques-Louis Nyst’s earlier experiences with the medium. 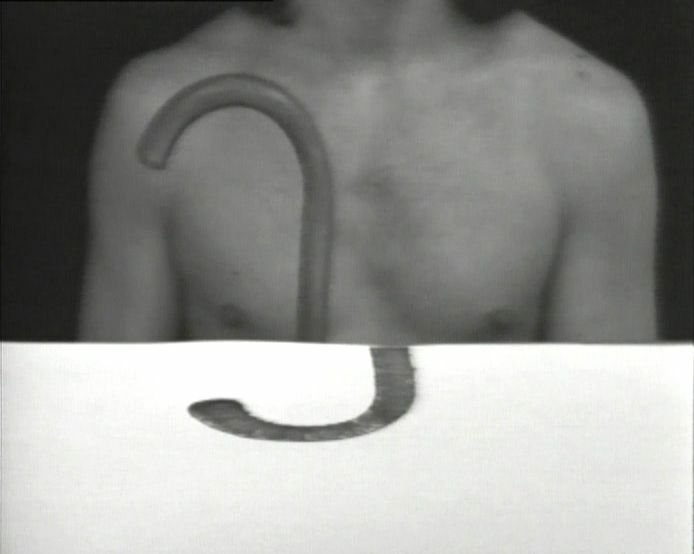 If we distinguish two periods in the Nysts’ video work (each corresponding to a different generation, that of the plasticist videomakers of the 1970’s and that of the video storytellers of the 1980’s), ’Le cygne et son image’ is clearly characteristic of the first, a time when plastic artists had only recently discovered video and used it still as a mere extension of their work, often resulting in somewhat conceptual and minimalist (yet ironical) pieces. In Nyst’s case, as his plastic work of the time was concerned with the poetical reading of everyday objects, his first videos will follow the very same path. It is almost as if he used the screen as a canvas where all sorts of objects can be placed and played with: from coffee pots and eggs to dolls and plastic bags. Nyst confronts these objects with the ways in which we represent them. The common and the banal are transformed into pure poetry. Nyst’s fake innocence, poetical humor and logical delirium are the result of associations, metaphors, displacements, connections, gaps and puns.